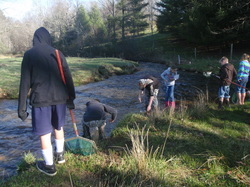 We expanded our "Bay Day" program to Floyd County in March, thanks to a grant from the New River Valley Foundation. 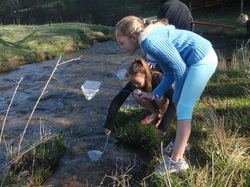 ﻿Floyd's River Day is a chance for fourth-grade students to get outside and get their hands on the topics they learn about in the classroom. 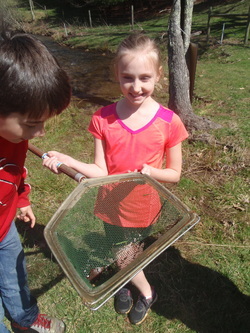 Keeping Virginia Standards of Learning goals in mind, the field experience teaches about clean water, natural resources, and wildlife, as well as how students can impact the world around them. 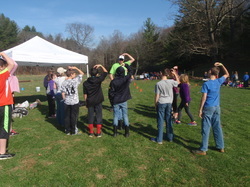 Having worked with us to start the original Botetourt Bay Days, Beth Weigandt from Camp Bethel brings her experience with outdoor education to teach about soils, and erosion. With the Erosion Games, she covers how erosion can impact streams and what kinds of things can be done to prevent the land from washing away. 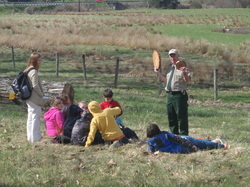 Apple Ridge Farms is a local nonprofit which lead the stream school at Floyd River Day. Denny McCarthy with the VA Department of Forestry has also been with us from the beginning of the Botetourt Bay Days. He and his assistants engage the students in learning how trees grow, why the forests are important, and what they can provide. 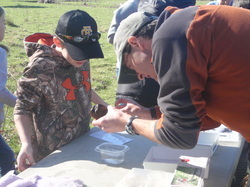 Tyler Painter provided sponge games and taught kids about water pollution. 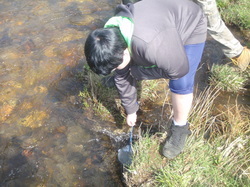 Enjoy photos from our first Floyd River Day!